To understand the internal arts taught by Moy Lin Shin, it is helpful to look at his teachers and the influences he worked with, those he studied and practised with, as well as those who came before him in this "style". There is a rich heritage of form, from Wu Yi Hui, down through Leung Tse Pang to Moy Lin Shin and others. Each one appears to have "tweaked" the form subtly, perhaps to enhance the style, reflecting their previous expertise and personal learning gained through years of practice. These names share pre-eminent reputations as leaders in their discipline, validated through historical record, word of mouth, demonstrations and push hands competitions, a "marker" for quality in past times. Mr. Moy was not solely interested in internal arts we typically associate (tai chi, lokhup, tsingyi, pa kua). Mr. Moy was a Taoist monk and co-founder of a temple in Hong Kong that studied the three religions of Taoism, Buddhism, and Confucianism. Meditation was a vital element of his practice. In fact, he indicated one's progress in tai chi would always be limited without the inclusion of meditation in daily practice. The stillness of meditation gained might then transfer to develop a balanced state in movement and in stillness. To further understand the principles Mr. Moy incorporated in his teaching we should also be aware of the predominant element in his personal practice, an active (as opposed to stationary) form of chi kung. Mr. Moy said he had six teachers in his life. Only the last two were really influential. This would include Leung Tse Pang, his tai chi and Lok Hup teacher (for which he dedicated the Gei Pang Lok Hup Academy in 1989) and his lesser known chi kung teacher, Mr. Yeung. 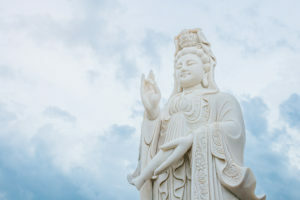 This chi kung is a free-form active movement, directed, when initiated, from internal movement that spontaneously drives external movements, all designed to open and work with energy in the body. 1 The references noted here are only one branch of the lineage. For further details and to see other similar examples begin from a web search engine and the lineage tree is quite wide and diverse in style. 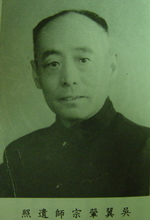 Wu Hui Yi was actually the first person to teach Lok Hup to the general public, outside the traditional closed-door schools in China who restricted access to the teaching. According to the History of Chinese Martial Arts, many of Wu's students were already experienced martial artists who took what they learned and merged it with their own knowledge. 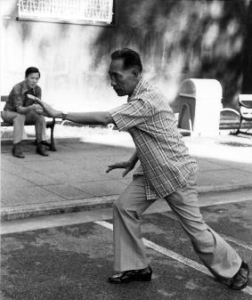 While Wu Hui Yi actually taught the form of Lok Hup Ba Fa to Leung Tse Pang, what was also shared were principles of movement and structure, valid for strength and balance in whatever 'form", be it tai chi, lok hup, tsingyi, pa kua, etc. the 45 degree step and squared hip. In Figure 1 (sorry for grainy picture), note the remarkable symmetry between Wu's postures and those that we see in pictures and video of Moy Lin Shin. In Figure 2, a side view, again note the attention to the basic principles we study as the foundation for Moy's tai chi. Keep in mind Wu was one of the top soft-style martial artists in China at the time. 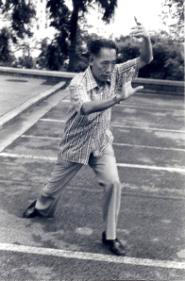 These examples illustrate the foundation for the form Mr. Moy brought to Canada in 1970, a foundation from one of the premier internal martial artists in China. -head, knee over toe, arms stretched. 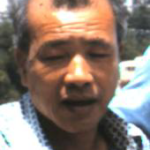 Leung Tse Pang Leung Tze Pang taught tai chi and lok hup in Hong Kong and was widely respected for his abilities. 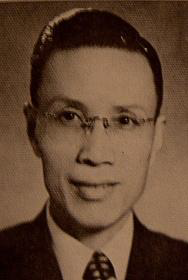 At some point in the 50's or 60's both Moy Lin Shin and Sun Dit became his students. Anecdotally it was said Leung only learned the first half of Lok Hup from Wu and the second half through other sources. For our purposes, however, we are more interested in the form and structure of his movements. Our current insight is through a Lok Hup video you can find on YouTube. Referring to this video, we see again the form Mr. Moy shared, the position of the front knee, the straight line fromthe heel to the head, the squaring of the hips, the arm positions. When watched closely there is something more. Slow the video down and more advanced concepts reveal themselves. Moves flow without stopping, from one to the other, rising/falling, expanding/contracting. Observe the turning of the hands, wrists and arms, a hint to the turning inside. 2 I include both Mandarin and Cantonese names, as I found it confusing in my research until I realized it was the same person whose name sounds different in a different dialect. 3 Figures 1 & 2 from book "Liuhebafa Chuan Illustrated " by Chen Yi Ren. around Fung Loy Kok opening. 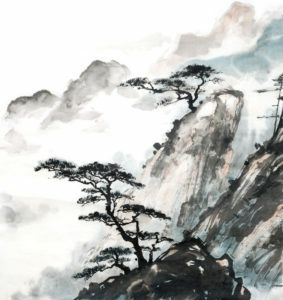 Moy Lin Shin reportedly trained in his youth as a Taoist monk in the Earlier Heaven Wu-chi sect of the Hua Shan School of Taoism. 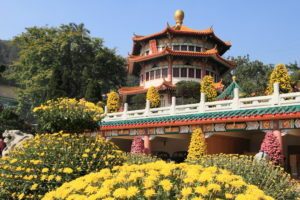 In 1981, the scope and depth of Mr. Moy's teaching was expanded with the opening of the Fung Loy Kok temple in Toronto. 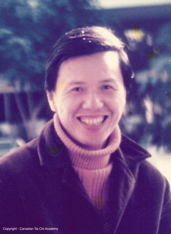 With Mui Ming-To's visit to Toronto in 1981, students were introduced to the practices of sitting meditation and chanting. Moy Lin Shin had worked intermittently with some students, teaching them the basics of standing meditation previously. 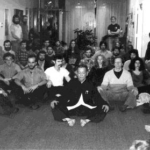 With the introduction of sitting meditation, students were introduced to new elements that would parallel the range of practice techniques in a temple setting. Sectarian controversy aside, the value of daily meditation was emphasized by Mr. Moy and Mui Ming-To, if for no other reason than to help open joints, reduce tension in the body. It provided a glimpse of the perceptual framework and feeling one should target while doing the set. "Mo naam" - "no thought", was a common correction Mr. Moy would provide as students moved through the set. 45 degree angles, hip square. Sun Di and Moy Lin Shin both learned Lok Hup and Tai Chi from Leung Tze Pang. 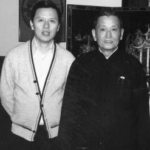 After the death of Leung in 1974, Moy and Sun continued to work together whenever Mr. Moy visited Hong Kong. 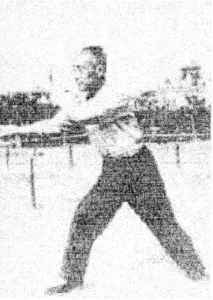 Sun Di was known in Hong Kong as an accomplished master of Tsing Yi and was well known for his Push Hands prowess. Through both videos and pictures from Hong Kong visits, we see a form that parallels Moy Lin Shin. 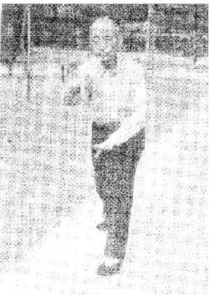 Sun's video from 1978 introduces an additional element, driving movements forward by dropping the hip and pushing the front knee past 90 degrees. This is a hint of an advanced technique requiring increased flexibility and strength in the joints. It should not be confused with a common beginner-intermediate error of letting the front knee go beyond 90 degrees without dropping the hip. The Lok Hup video of Sun Di on YouTube also shows the continuous motion of the second half, reminiscent of Leung Tze Pang's continuous motion. While Moy Lin Shin wanted to teach Lok Hup in this style, he regretted most students' skill level was inadequate for the task and told us to work harder. Part of the "tweaking" of our tai chi was his years of experience practising with Mr.Yeung, his chi kung teacher. It was said Mr. Yeung told Mr. Moy he could teach what he had learned, but not until Mr. Yeung had died. When Mr. Yeung was asked, "What is chi kung?" he responded, "Man has been trying to answer that for 3000 years." He did add however, that internal martial arts work from the outside of the body in, whereas chi kung works from the inside of the body out. I have written this short piece to help others understand the foundation of the health value andheritage of a giftpassed down from Mr. Moy's teaching and those before him. Mr. Moy knew exactly what he was teaching. His teaching was flexible, in that it varied according to the level of his audience and his purpose at the time. Some saw his martial skill(paralyzing you with a few fingers on your arm). Others saw him mainly as an organizer with little connection to his art. I believe we unknowingly witnessed and were party to a rare experience of valuable Chinese history & culture derived from some of the most respected martial artists in China and Hong Kong. I appreciate your comments and questions about this content.